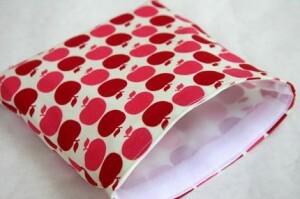 Many moons ago… I shared a post on how to make your own reusable sandwich bags. I think it’s time to share it again! With back to school upon us… now is the perfect time to start thinking about packing lunches and snacks. I’ll also be sharing this on the Tillamook Cheese Facebook Page. Tillamook will be donating $10 to Feeding America for every tip, snack, or recipe shared on their Back to School tab. I love doing social good! A piece of organic fabric 8″ x 13.5″ (This is the lining. I like using organic fabric on the inside, because it touches the food! 1. Iron both pieces of pre-washed, organic fabric, then place them RIGHT sides together and pin along the short edges. 2. Sew each short edge of your fabric with a 1/8″ seam allowance. Fold and iron the tops of your fabric to create a nice top and bottom edge. 3. Separate your Velcro into two strips: the rough side and the soft side. 4. Start pinning the rough Velcro across the top of one side. Pin the soft side of the Velcro across the top of the other side. Sew the Velcro in place by sewing across the top and bottom of each piece of Velcro. 6. Sew the unfinished edge of your fabric with a 1/2″ seam allowance, then trim off the excess fabric! 7. Turn your bag right side out and iron again. The Velcro should work perfectly to close up your sandwich bag. 8. Now you’re all set to pack your sandwich! I am too lazy to make my own reusable sandwich bag but I have some I got from the Disney Rewards program and some I got from re-pacbags that I LOVE. I love that they have zippers instead of velcro! where do you like to buy the organic fabric you use for the lining?